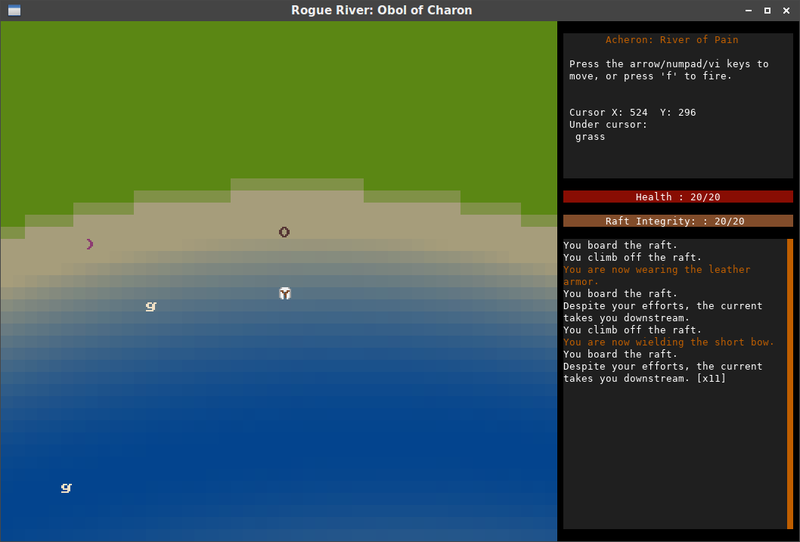 Instead of a boring set of rooms and corridors, fight enemies while sailing down a river! Navigating the rapids while fighting enemies is what makes this game fun. There are five levels, each corresponding to a different river from the Greek Underworld. The river is your main method of transportation, but hitting rocks will damage your raft. There's a few enemies, like skeletons and giants, that are confined to the shores. Others, like the centaurs, will shoot at you from the shore. The more dangerous enemies, like the harpies and manticores, can fly across the water to chase you. Navigating the river and avoiding the rocks provides for interesting game mechanics. 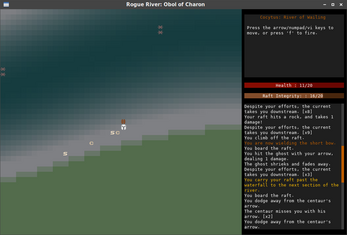 While the river provides relative safety, you have to go ashore to get the armor and weapons you'll need for later levels. You also have to balance attacking and navigating around rocks, since you cannot do both in the same turn. Hmmm. It is weird how the download files section doesn't appear in the itch.io Mac and Windows clients. 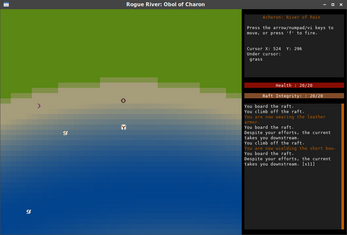 But it does appear when https://chaosdev.itch.io/rogue-river is opened directly in Safari and Internet Explorer. Hi. I am TokyoDan and seven months ago on the reddit rogue thread I asked about the name of this game that I heard on the Roguelike Radio podcast. You answered my question but I never got an email notification and I just found your reply today (I don't use reddit that much). I will give your game a try. It looks realy interesting!